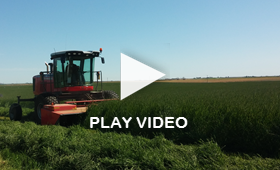 Timothy Hay for Cows | Anderson Hay & Grain Co., Inc. Many who raise dairy cattle find Timothy hay to be a key ingredient in an overall feed program. Timothy hay is noted for being high in fiber and energy content, while also being noted for being relatively low in protein content. It is a great ingredient for the overall health and conditioning of the dairy cow, and combining timothy with other higher protein ingredients can be a great way to balance the cow’s energy and protein needs. Timothy hay is recommended by many experts due to its ease on various animal’s digestive system as well as promotion of bowel regularity. Additionally, there have been scientific studies done that show Timothy hay is an ideal feed for pregnant or lactating cows. Another advantage is that it is relatively low in moisture content, preventing mold and rot. Timothy hay can help prevent hypocalcemia, “milk fever”, which occurs right before or after calving and can impact up to 10% of the herd. Adding Timothy to a feed regiment helps reduce potassium concentrations, to help avoid hypocalcemia. For beef cattle, Timothy has been known to enhance beef flavor, and is fed to world popular wagyu and Kobe cattle in Japan. 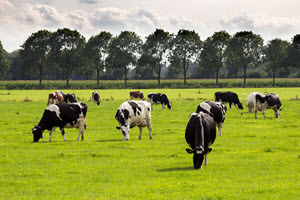 Grass-fed cattle are held to high standards of feed and care, and the meat from these cattle is known to be tender, firm, with good marbling and a unique flavor.